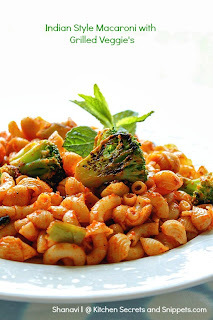 Indian Style Macaroni : I make this very often for my brunch when I ran out of ideas what to make for the day. The main highlight of this dish is adding grilled vegetables, with hints of pav bhaji masala on every bite. Tastes delicious, try this once and share ur views.. Again this pic was taken almost 2 years ago and so this is from my drafts..
Wash the veggie's , dry them. Cut the veggie's into big chunks or bite sized pieces. In a bowl add the yogurt, kasmiri red chilli powder, turmeric powder, salt, garam masala powder, ginger garlic paste, mix well to form a paste. Dump in the veggie's and mix well with the masala. Cover and refrigerate for an hour. Heat a dosa pan with very little oil and place the veggie's one by one. Grill the veggie's one by one until it is cooked thoroughly, flipping side to side. Take the cooked and grilled veggie's and gather them in a plate. Cook the macaroni according to the instructions given on the back side of it's cover. Make sure to cook for an extra 3 minutes to get a soft macaroni, not al dente. Heat the remaining oil in the same pan, fry the minced garlic for few seconds, then add the onions, saute for a minute until it sweats. Now add in the tomato puree and cook for another 2 minutes until the raw smell of the tomato is gone and the oil comes out. Add in the curry leaves, turmeric powder, kashmiri red chilli powder, pav bhaji masala powder and salt and combine well. Stir together the masala for 2 minutes. Now add the tomato paste, mix well with the masala. Cook the masala a little more seconds and add a tbsp of water to stop from burning the masala. Mix well, cook again for few seconds. Now dump in the grilled veggie's, and give them a nice toss. Stir in the cooked macaroni and give it a nice toss. Simmer the macaroni for a minute in low flame and serve warm. looks yummy I hv to be doing more of grilled vegetables .. Wish i get that plate for my dinner tonite,i'll be thankful for u..Cant resist. yOur pics are so gorgeous that most of the time I skip the recipe to drool over the pics :-) . 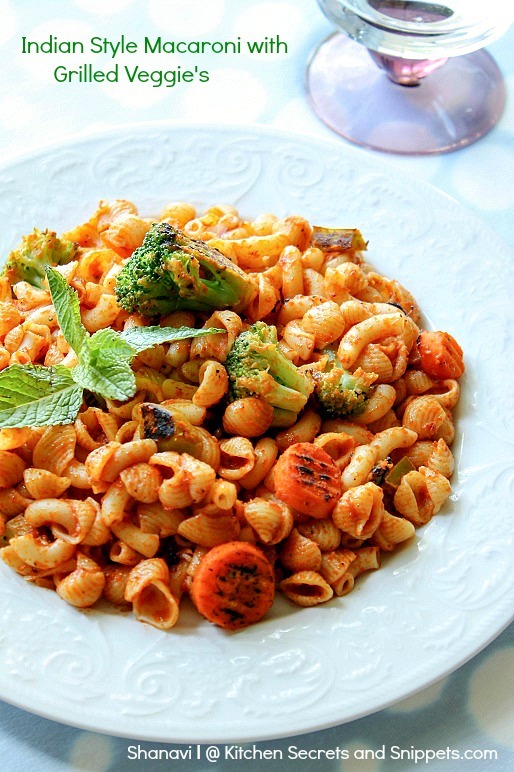 Absolutely love this macaroni.. Perfectly Indian'sed the pasta..
Looks amazingly delicious, Thanks for sharing.